Provisional cancellations can be frustrating, just like dumb [mute] cancels, when it is not possible to identify where they came from. 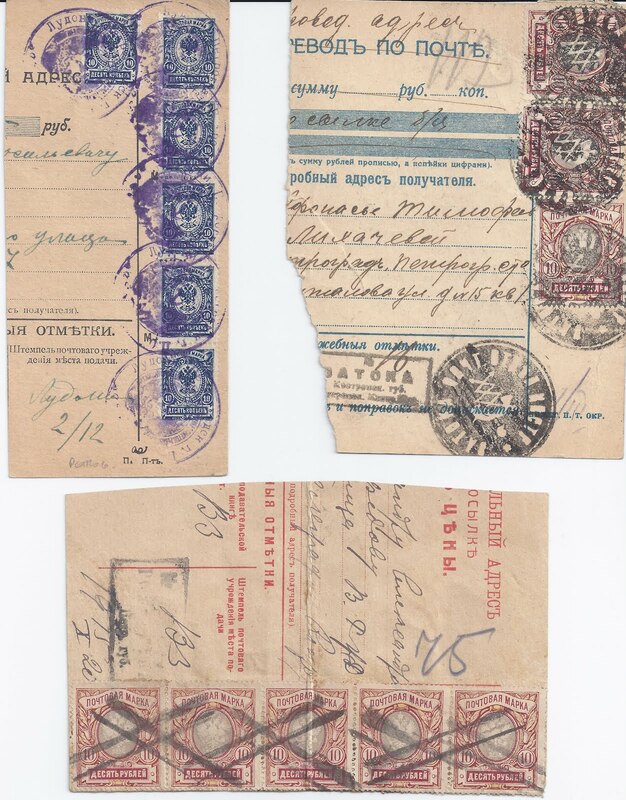 The fragment of Insured Prarcel Card with 10 kopeck stamps is from LUDONSKOE PETROGRAD probably in 1920 or 1921 with the 10 kopeck stamps revalued x 100. A Soviet seal with hammer and sickle provides the cancellation. The Imperial seal in black with posthorns and thunderbolts, used to cancel 10 rouble stamps, can be identified as from ..ATOKA in Kostroma Guberniya, but I cannot work out the first letter: nor can I find it by trying all the likely letters in Gary Combs' post office list.The item is part of a Money Transfer Form used as a Parcel Card. On the back there is a PETGROGRAD 19 3 21 receiver. The final item has 10 rouble stamps cancelled with an improvised grill, a bit like those you see on Post Office Savings Bank cards. It's dated 15 X 1920 and has part of a PETROGRAD receiver on the reverse. The cachet at bottom looks like it is inscribed PETR GUB and the place name commences RO .. but I cannot complete it. ROMANOVKA would be a guess. A nice little collection could be made of such items, though they are not very common.